Make your '07-'17 Jeep Wrangler's Hood stand out with this tough looking "Altitude" stylized Hood Graphic kit. 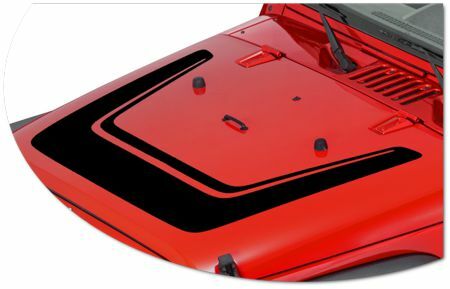 Kit is specifically made for the '07-'17 Jeep Wrangler factory Hood and will not fit any other vehicle. While graphic offered is close to the same size and shape of the OEM "Altitude" decal it does not feature the same embossed pattern and finish. Graphic offered is simply a solid color as selected with no printed or embossed pattern.